I am not a MercyMe fan, and I can understand why I Can Only Imagine, their first major hit song that was so popular it even found its way out of Contemporary Christian radio into country and pop stations, might have suffered from over-saturation. This song has become a mainstay in many Christian worship and funeral services since its 2001 debut. The film I Can Only Imagine chronicles not the actual writing of the song, which according to its songwriter Bart Millard took ten minutes, but Millard's life story and all the events that inspired the creation of perhaps the most recognized faith-based song outside Amazing Grace. Bart Millard has a love of music, mostly as an escape from his parents' very troubled marriage. As a child, he cannot please his drunk, abusive father Arthur (Dennis Quaid). His mother takes him to a youth camp, where he re-encounters Shannon, who is a Christian and unbeknownst to him, has a major crush on him. After he comes back, however, he has a nasty surprise: his mother has left and leaves him with Arthur. Arthur was a major football star, and this is how an older Bart (J. Michael Finley) tries to win his father's love and approval. Bad advise about 'never being brought down', however, causes Bart a career-ending injury. He has no choice but to live out a version of Glee: the football jock forced into the glee club for his extracurricular course. Bart adjusts to being the sound guy, but his glee teacher finds him singing along to one of his many cassettes, oblivious that anyone is actually hearing him. To his shock and horror, Bart finds himself as Curly in a production of Oklahoma!, and to his bigger shock, he's actually good. Even his beloved 'Memaw' (Cloris Leachman) cannot believe that is her Bart singing. Arthur isn't won over, nor does he tell anyone the truth of his health issues. Bart grows closer to Shannon and to faith but he is still an angry young man. Arthur slams a plate at Bart's head before he goes to church to sing, and this is the last straw for him. Bart is having a great crisis, for he not only has ended his relationship with Arthur but with Shannon, after she not-so-subtly suggests in front of Bart that "someone" needs prayer. As soon as graduation comes, he flees his Texas roots to Oklahoma City, where eventually he begins his pursuit of a music career with a group of musicians. Bart and his bandmates, calling themselves 'MercyMe' after one of his Memaw's favorite sayings, hustle to get the attention of the record industry. Eventually they do find a producer, Scott Brickell (Trace Adkins), who sees something there but who also tells them they are not ready. Despite his own misgivings, Brickell rides along with them, and manages to get a showcase for them in Nashville. Bart forces his way to the post-concert meeting, where he's told again he isn't good enough. The memories of Arthur's dismissive words come back to Bart. Brickell urges him to 'stop running from the pain' and settle things with his father. Bart goes back, and finds a more humane Arthur. Despite Arthur's efforts to make peace and ask forgiveness, even admitting he has found faith and is attempting to make sense of Scripture, Bart will not yield and maintains his anger. It is only when he learns that Arthur has terminal pancreatic cancer that Bart relents and starts mending his relationship. They have a brief time together before Arthur dies, and at the funeral, Memaw gives him words of wisdom, telling him to imagine all the things Arthur now sees. After returning to MercyMe, Bart still struggles with his own emotions: about Arthur, about what happened, about his failed attempts to reconcile with Shannon. He looks over an old journal from his first youth camp, and finds the word 'Imagine' and the phrase 'I can only imagine' over and over. Taking this as a sign, he writes his new song. The song gets the attention of one of Bart's inspirations, Amy Grant (Nicole DuPort) through her friend Michael W. Smith (Jake B. Miller), both major Christian music icons. Grant needs a 'comeback' song, and thinks I Can Only Imagine would be perfect for her new album and tour. She plans to debut it at her first concert and has already recorded it. However, she finds she cannot perform it, and asks Bart, who is in the audience, to sing it instead. All his emotion pours out to a thunderous reception. Shannon, who was at that show, reconciles with Bart, and Grant gives the song back to MercyMe. In some ways, I Can Only Imagine is a bit fast and loose with facts. For example, it isn't until the end that we discover Bart had a brother. Other aspects, such as his relationship with his mother, are pretty much rushed through. However, I think Alex Cramer, Brent McCorkle and codirector Jon Erwin (who directed with his brother Andrew) were not aiming for a strict chronological story. Instead, they were focused on Bart's own story, and one of the many pluses of I Can Only Imagine is that Bart Millard's story is one that many people outside of their faith or faith itself can relate to. The issues of abuse, emotional and sometimes physical pain, redemption and forgiveness are issues that do not impact only those with a faith system. It's a pretty universal story, as there probably has not been a person who has not had issues with their parents. It's also a pretty human emotion to struggle with death and what comes after. Millard's faith leads him to believe in an afterlife, and the song, when heard, expresses that peace that surpasses all understanding. It speaks about hope for those who have passed on and for those who remain. I find that I Can Only Imagine, more than most Christian-themed films, is not afraid to show Christians in a bad light. Bart Millard is a deeply flawed and human individual. Some of his flaws are for comic effect: the shock of his Oklahoma! casting causes him to fall over as he's trying to balance himself on his wheelchair's wheels. Other times, though, his reaction to things is surprisingly human. He remains angry at his father, even after Arthur struggles to make amends. Bart yells, he snaps at people, he pushes Shannon away. The image I Can Only Imagine creates of Bart Millard is not that of a saint, but as a man who even while acknowledging and feeling Christ within him also at times lets his human nature get in the way of being that new creation. As Christians, we should forgive when someone asks forgiveness from us. As sinners, we can hold onto our hurts and angers despite our faith. It's a major credit to the film in finding Finley to play Millard. A Broadway performer making his film debut, Finley makes Bart into a very relatable person: pleasant, enthusiastic, troubled, hurt, capable of causing hurt, angry, regretful and even a bit shy. This is an excellent debut for the actor, who keeps Millard grounded in reality, neither setting him up to be a metaphorical voice of God or a cold, hard cynic. The Bart Millard that Finley creates is that of an average man, feeling his way across life with a faith that he sometimes fails to live up to but which also gives him hope. Quaid may have been a bit of a scenery-chewer as Arthur at times, but in his later scenes, where he is a reformed man, he does display Arthur's struggle with this new man he is attempting to be. Quaid brings out that struggle, that unsteadiness in a man who is seeking out redemption and forgiveness to beings he does not know and that he's a bit afraid of: Christ and Bart. 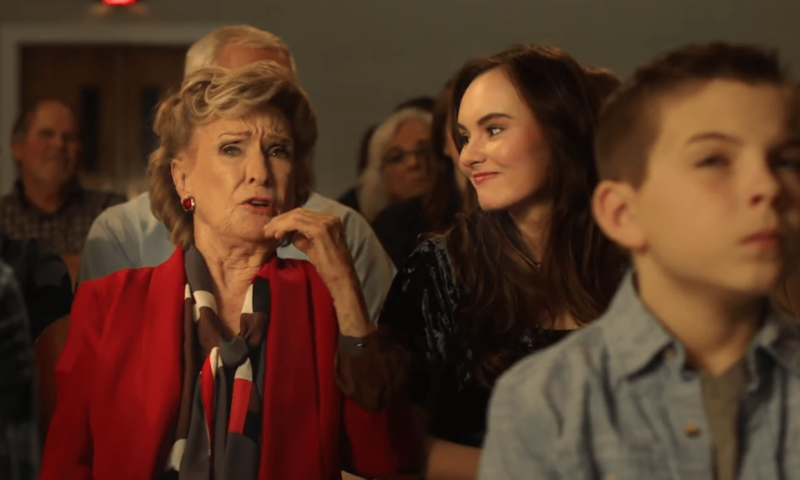 It is nice to see Leachman, even if her role is small, and Adkins is carving out a nice side career as an actor, even if he too had a small role. Madeline Carroll as the long-suffering Shannon did a good job, though the film sometimes forgot she was in there too. As this was Bart's story, the formation of MercyMe or their transition from rock to a softer sound did get left a bit off, but again, this is not the MercyMe Story, or even the story of I Can Only Imagine the song. Instead, it's the story of this one man, Bart Millard, who went through very painful early years and came out of it inspired, through his faith in Jesus Christ, to create something that has brought comfort to thousands upon thousands. Scripture tells us that all things work together for good to them that love God, to them that are called according to His purpose. It was sad and painful and tragic what Bart Millard endured, but out of that came a modern-day hymn about a joyful future past death. I Can Only Imagine the film touches the viewer as deeply as the song. This is The Lord's doing, and it is marvelous in our eyes.